Robots in various sizes and shapes are here, but here is one robot that boasts of not only its look but also of its energy source, the RoboJelly. The RoboJelly is basically your robot jellyfish, created by researchers from Virginia Tech and University of Texas at Dallas. It stands out from the rest of the bio-inspired robots with its infinite source of energy which is its surroundings. It takes its power from hydrogen and oxygen flowing from its actuators– yes, with the RoboJelly forever swimming in its energy source, it will never run out of fuel. However, the researchers admit that they still have a lot to look into; for example, it takes much power to separate the two elements in water, and it is only through such conversion that RoboJelly is able to function. 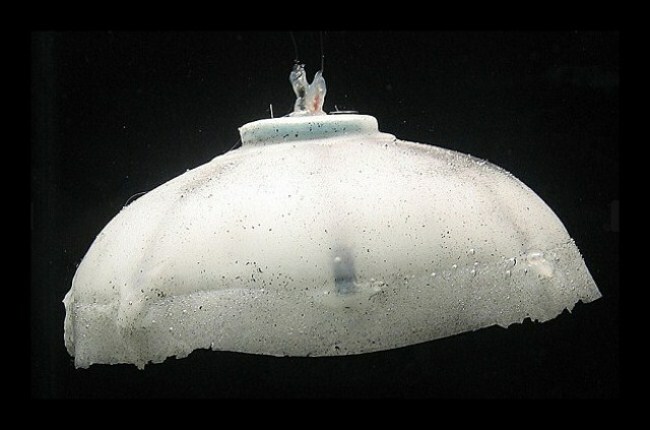 The RoboJelly is seen to be useful for spying enemy submarines or for checking water quality and ecosystem.